I reached NOTAM in the early afternoon and was given a tour by Cato Langnes (Studio Manager). I was able to quickly catch Gyrid (whom I met through the Compose With Sounds project) and to meet some of the other composers working in the studios. Gyrid introduced me to the Sound Devices field recorder, and once I’d had a crash course I started making some recordings. Many of these are just test experiments, as I work out how the field recorder and microphones are suited to my needs. But I was rather pleased with the sound of the cable cabinet. I knocked into one of the doors and then decided to play them percussively. Bring on the next few days of recording! 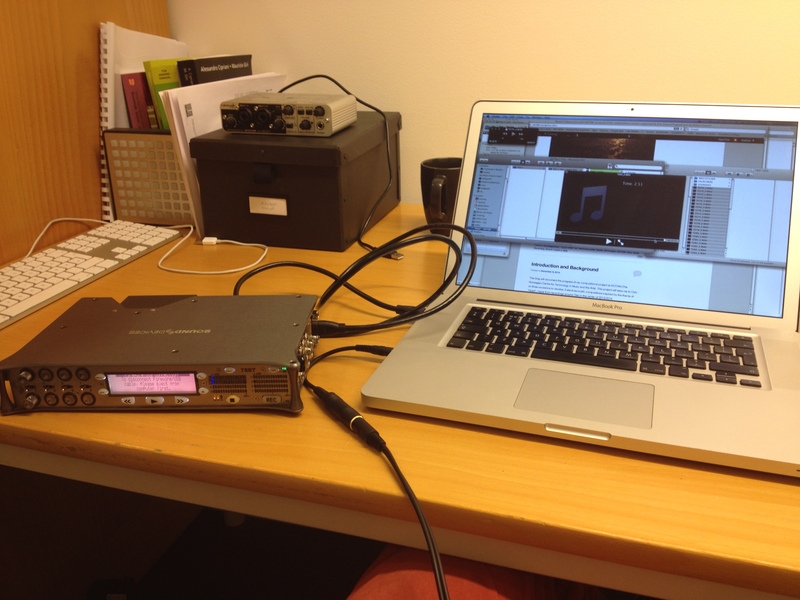 This blog will document the progress of my compositional project at NOTAM (The Norwegian Centre for Technology in Music and the Arts). This project will take me to Oslo on three occasions to develop 3 electroacoustic compositions inspired by the theme of “Quiet”, made from recordings around Oslo in the winter of 2013/2014. The compositional concept of “Quiet” is often ignored in music, where the main focus is usually about what sounds can you make. This project will seek to explore the subtleties and acoustic character of spaces and locations through minimalist means. The compositional works in this project will use recorded sounds, as in my previous works, and seek to draw listeners into an immersive and enveloping sonic environment by demanding attentive listening. The steep valleys and fjords around Oslo will provide a sonically diverse and unique soundscape, with varying vegetation, snow and ice affecting acoustic response. Working on the ‘Compose With Sounds‘ project as a commissioned composer I was very pleased to meet with other commissioned composers from across the EU partners and very much inspired by the works of the composers based at NOTAM in Oslo. The NOTAM centre has a highly active community of local artists who I hope to engage with in discussion, both regarding their own works and also to receive feedback on my own pieces as they develop. I am very pleased to have received funding to support this project from Arts Council England and the British Council, through their Artists International Development Fund (AIDF).